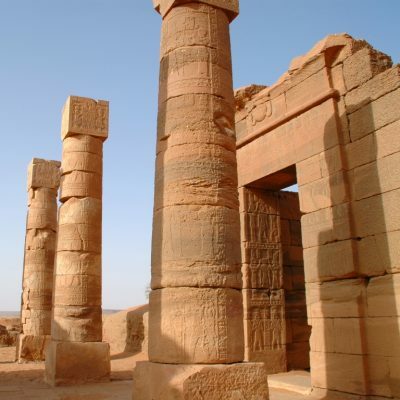 This tour shows all the major archaeological sites of the Northern part of the country and will end with a wonderful diving cruise in the crystal water of the Red Sea. 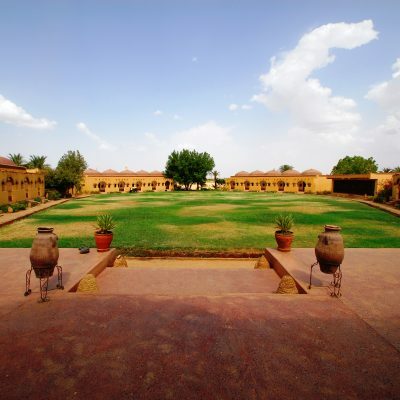 Some overnights are in our exclusive properties of Karima and Meroe. 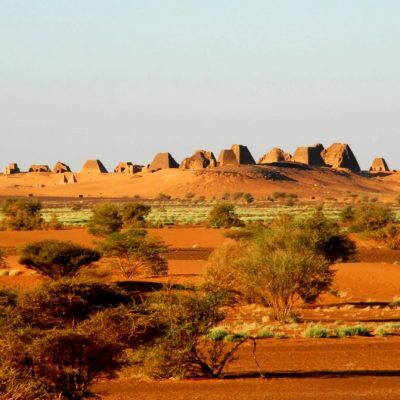 This arid and wild region of extraordinary archaeological interest and beautiful landscapes becomes accessible even to those reluctant to sacrifice their comfort. Cruise on board of a charming schooner. 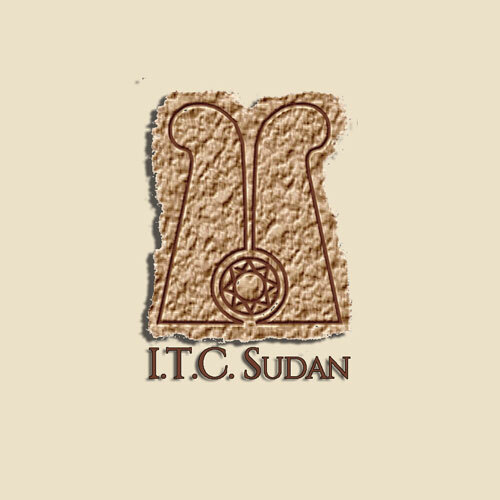 Breakfast at the hotel and then Khartoum city tour. 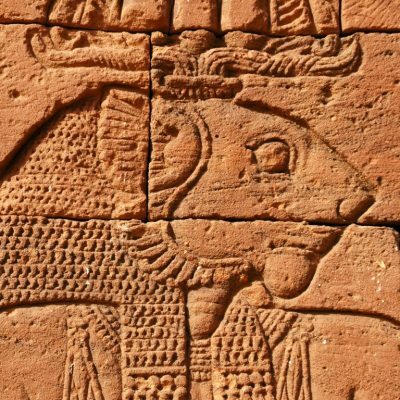 We first visit the Archaeological Museum that, besides many beautiful objects, contains two beautiful temples rescued by UNESCO and moved from the Lake Nasser area, when it was flooded by the water. 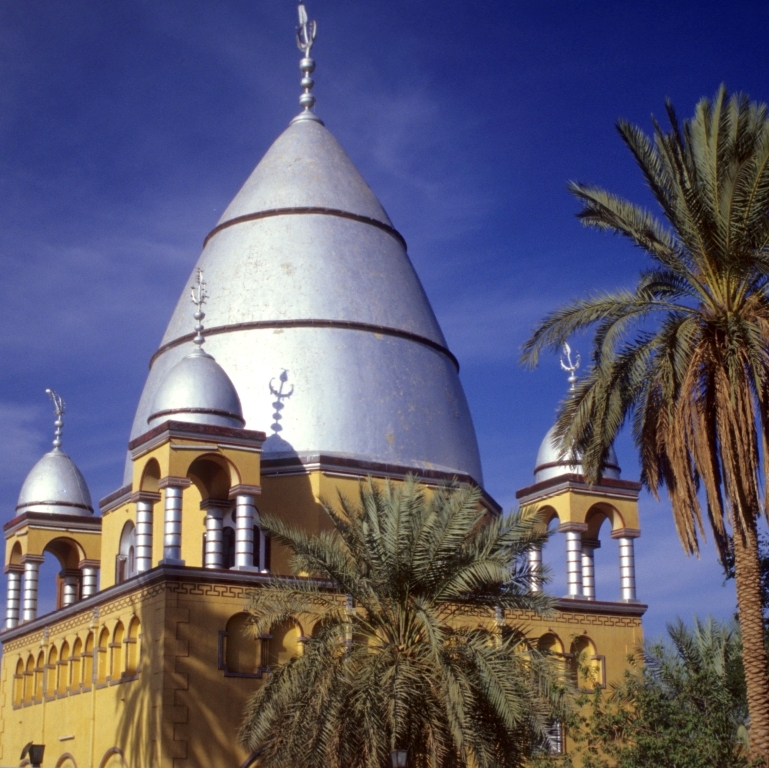 We then cross the Nile over the confluence between the Blue and the White Nile to reach Omdurman to visit the Khalifa’s House Museum. Lunch NOT included. In the afternoon we visit the colourful souk and then at sunset time we move to Khartoum North to watch the traditional Nuba Wrestling. Return to the hotel. 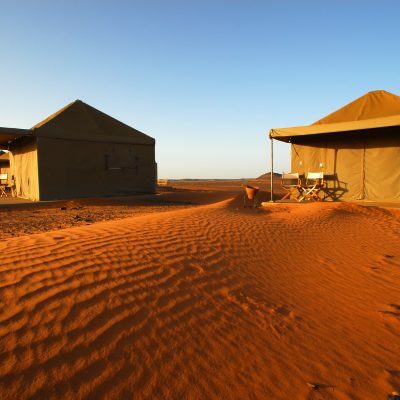 Dinner NOT included and overnight stay. 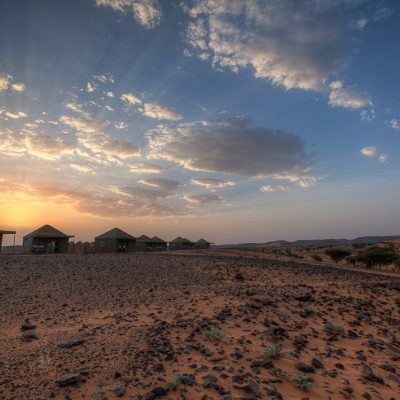 Early in the morning breakfast at the hotel and then we begin the journey northward through the Western desert. 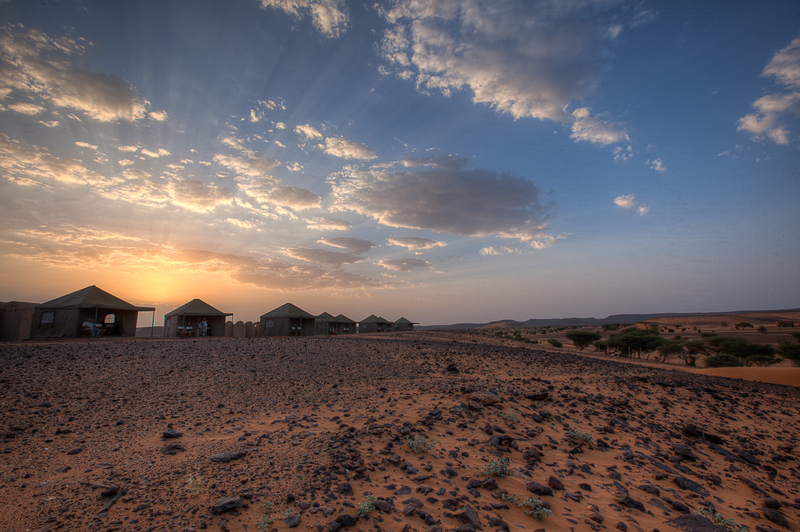 We travel in a flat desert where the view can span 360° around and we reach Wadi Muqaddam with its many acacia trees. We will stop at the “chai houses”, literally tea houses, simply a sort of very Spartan “motorway restaurants”, in the desert where local truck drivers usually stop for a quick meal and some rest. 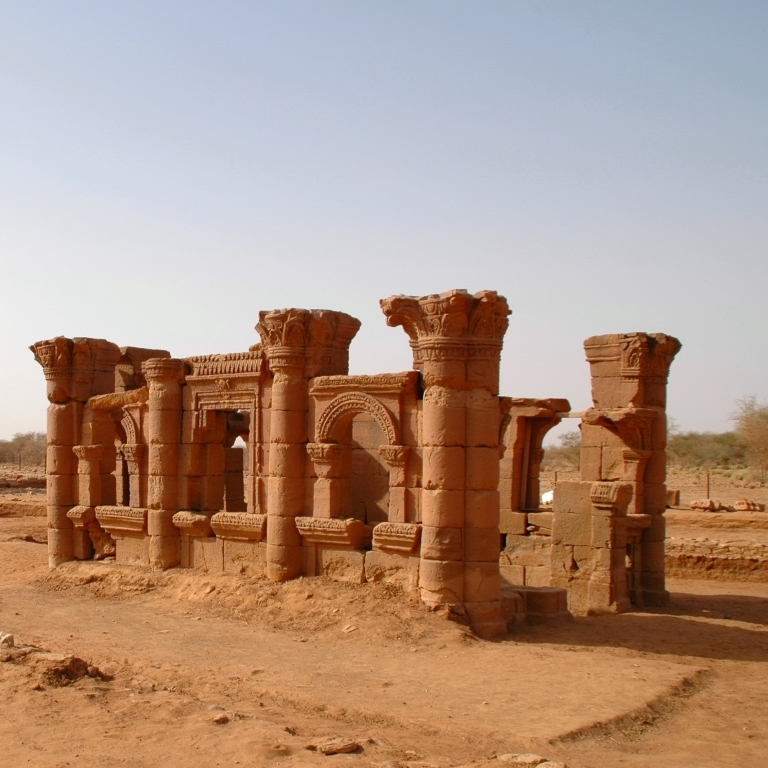 After 6 hours drive, we reach the site of Old Dongola, where there are the ruins of a Christian Coptic temple with marble columns as well as several rest of churches situated on the banks of the Nile. 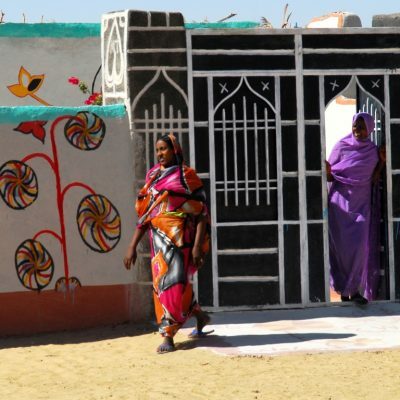 We continue our journey along the Nile crossing picturesque Nubian Villages with their houses with painted entrance doors with typical patterns and flowers. 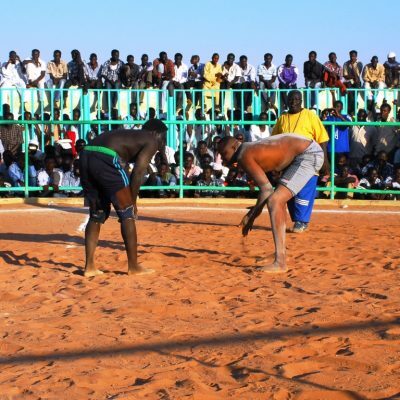 The population speaks a different language from the Arabs, and also the Islamic religion is not as “strict” as in other regions. We visit the beautiful village of Gaddar. 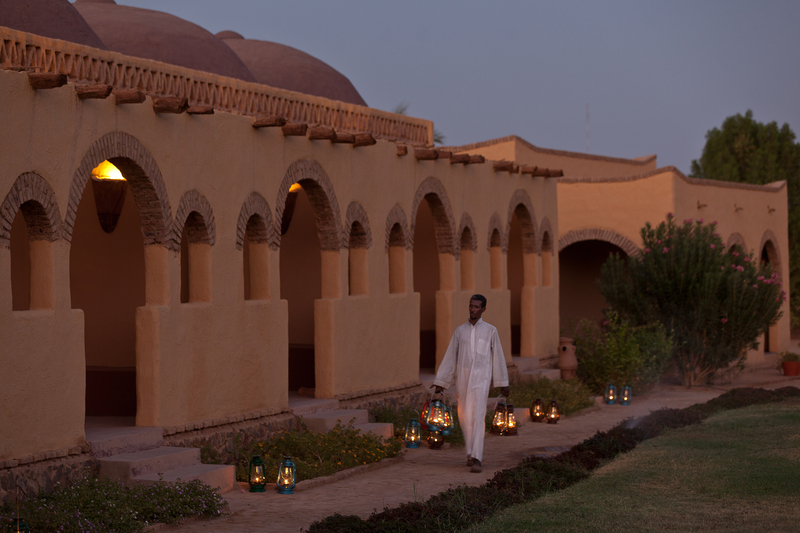 Late in the afternoon arrival in Karima where we check in at the charming Nubian Rest House just at the feet of Jebel Barkal. Dinner and overnight stay. 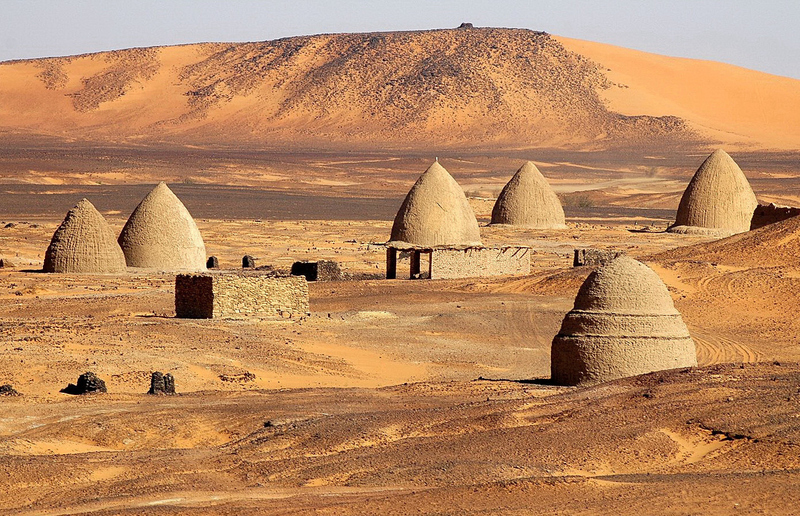 Landmark in the Nubian Desert, Jebel Barkal «Jebel» means Mountain in Arabic can be seen from a few dozen kilometres whilst still in the open desert. At the foot of this wonderful and isolated red sandstone mountain, considered holy since the ancient times, there is a big temple, dedicated to the Pharaohs of the New Reign and to their patron, Amon. 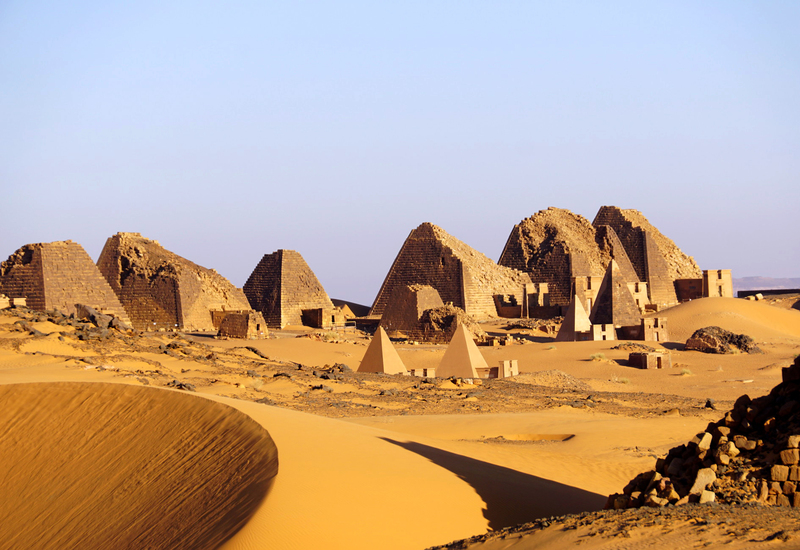 Amon’s ancient “Pure Mountain”, the Olympus of the Nubians, was the religious Nubian heart for more than 1000 years. 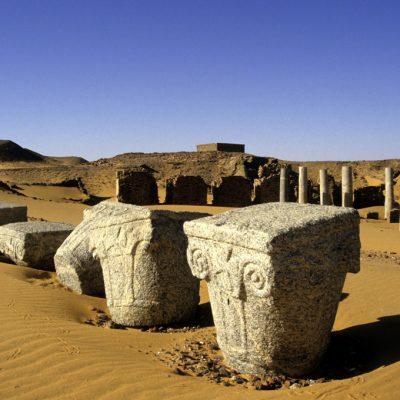 Besides the ruins of the big temple there are still several sculptured granite rams that were supposed to border a long avenue that probably led to the pier on the Nile. 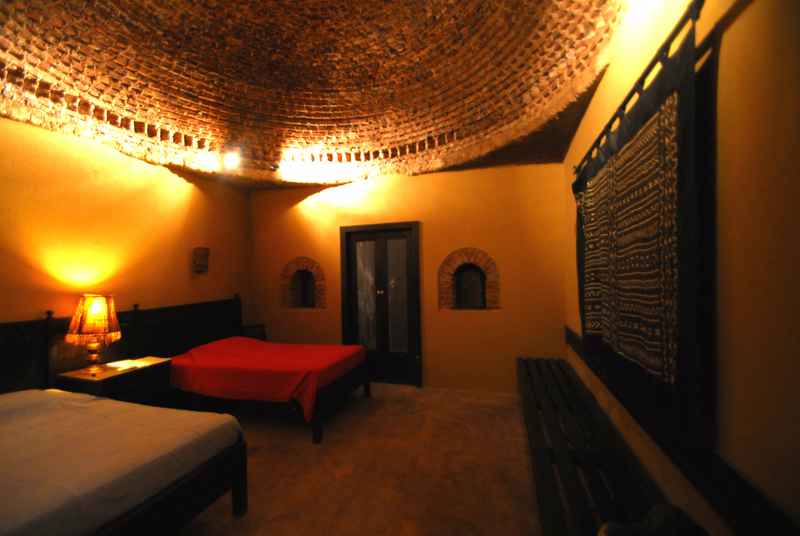 In the mountain wall there is a big room decorated with bas-relief. 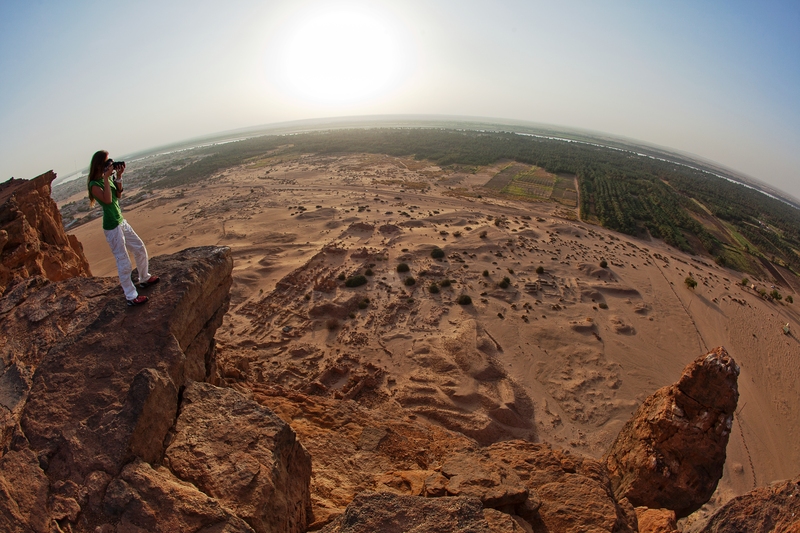 The Jebel Barkal archaeological sites are on the World Heritage list. 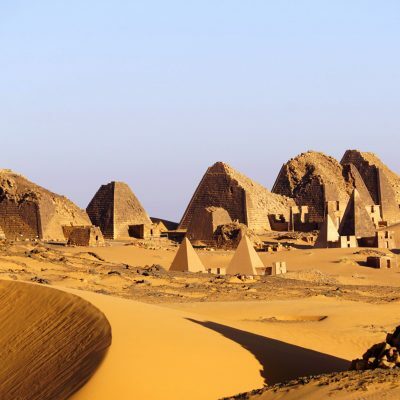 The Royal necropolis of the ancient city of Napata, the Nubian capital (from 800 to 400 B.C.) 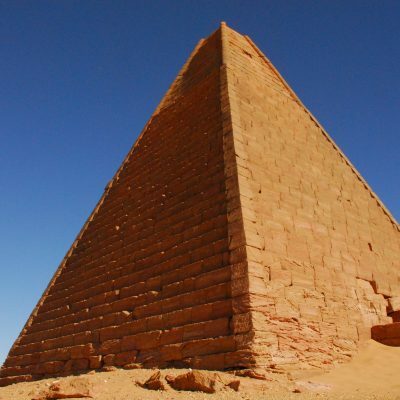 before the Meroitic period, had a large number of pyramids, located in three different places: few hundred metres north of Jebel Barkal; a dozen kilometres southwards from the holy mountain, in El Kurru; in Nuri, which is located on the other bank of the Nile. 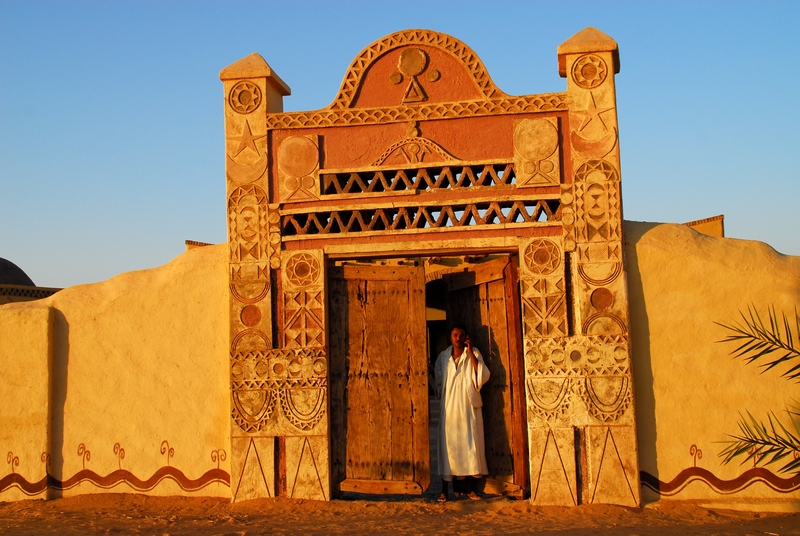 After lunch at the Nubian Rest House we then move southwards to the village of El Kurru where there is one of the necropolises of the ancient capital, Napata. 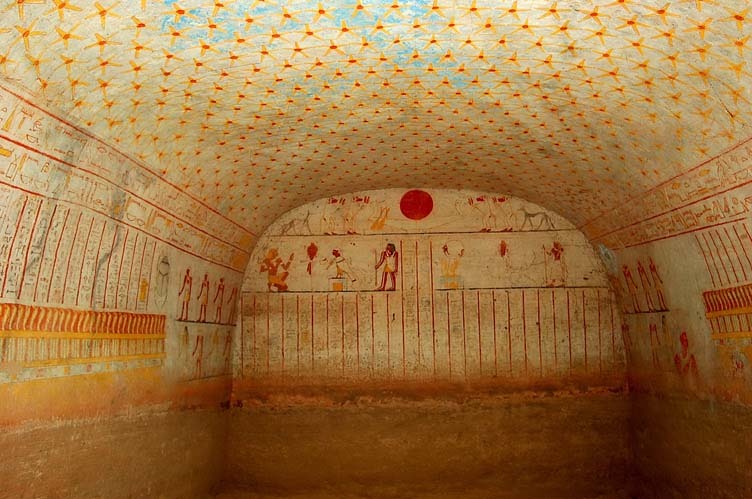 Here we can visit one tomb, which is excavated in the rock under pyramids – partially collapsed – and it is decorated with images of the Pharaoh, of the gods and multicolour hieroglyphic inscriptions. 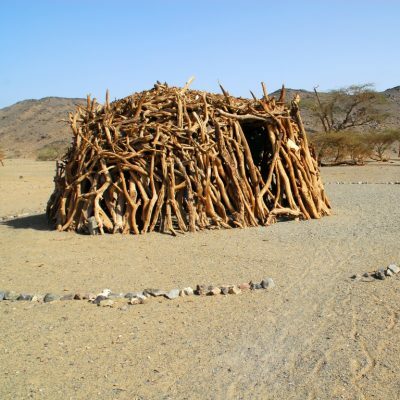 The trip goes on with the visit to a site, rich in fossil trunks in the desert. 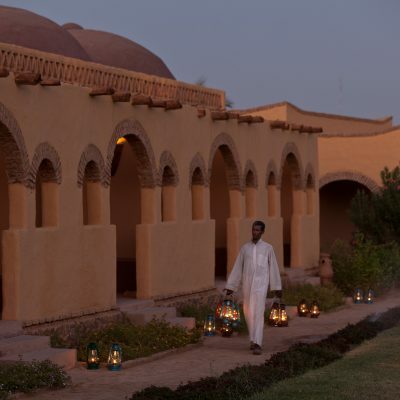 In the evening return to Karima, accommodation at the NUBIAN REST-HOUSE, dinner and overnight stay. 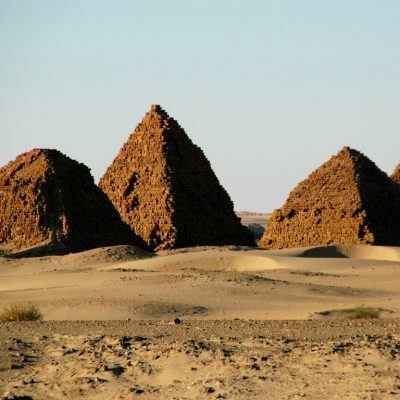 Not far from the Rest-House we cross the Nile to briefly visit the archaeological site of Nuri where we can see many pyramids among which there is also the one of the great Taharqa. 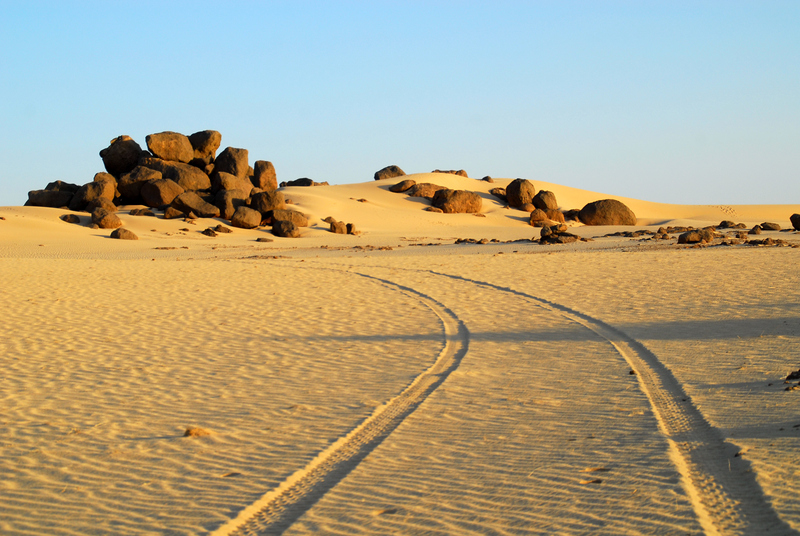 Little walk and then we enter the Bayuda Desert. This desert is an area bounded by the loop that the Nile forms between the 4th and the 6th Cataract and characterised by sharp black basalt mountains, most of them volcanic and typically cone-shaped. 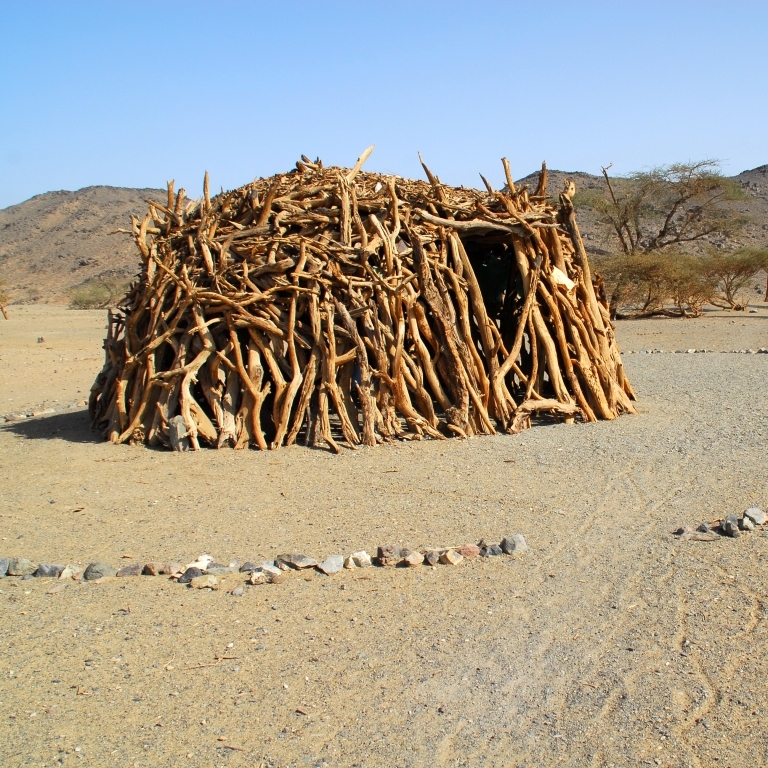 They alternate with level pebble stretches and large valleys crossed by dry wadis, where little vegetation can be seen. 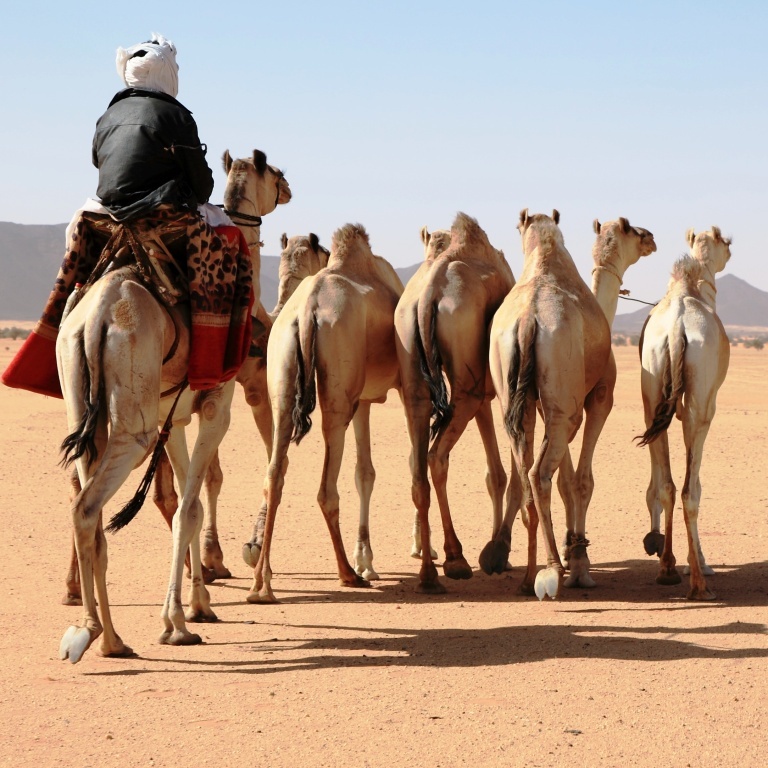 It is very likely to meet isolated groups of Bisharin nomads, who live in familiar groups in small huts made of intertwined branches close to the rare water wells, with their caravans and herds of camels and donkeys. 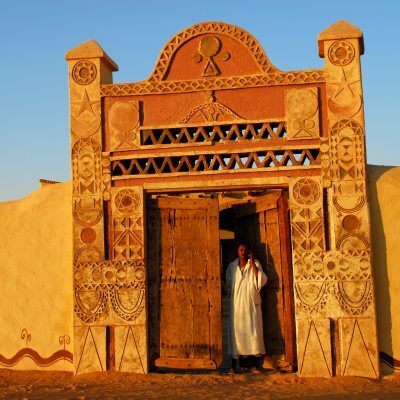 After a picnic in the desert, we continue travelling until we reach the town of Atbara, located on the confluence between the Nile and the Atbara River. Here we cross the Nile for the last time. 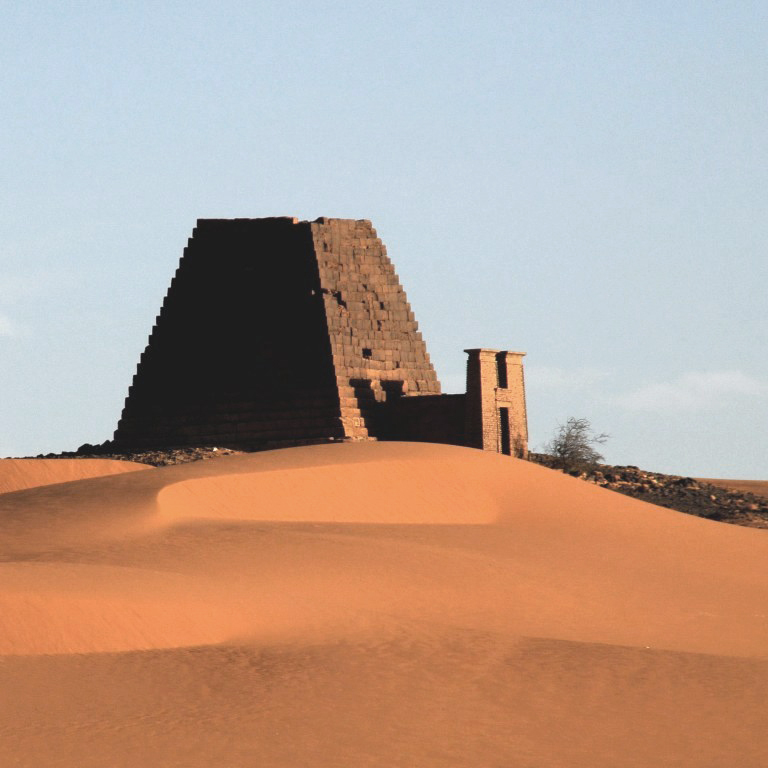 All of a sudden, we can glance at more than 40 pyramids, located on top of a hill, some of them perfectly preserved that belong to the Royal Necropolis of Meroe. 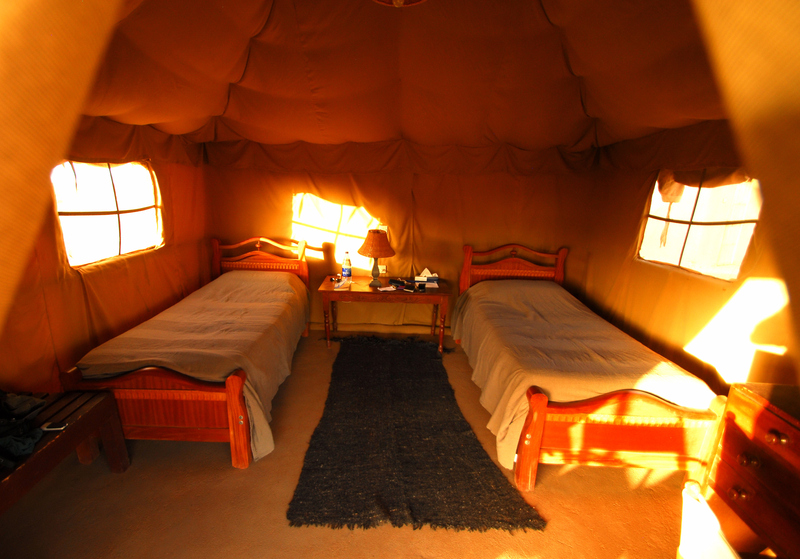 Arrival at the permanent tented camp of Meroe, with a beautiful view onto the pyramids. 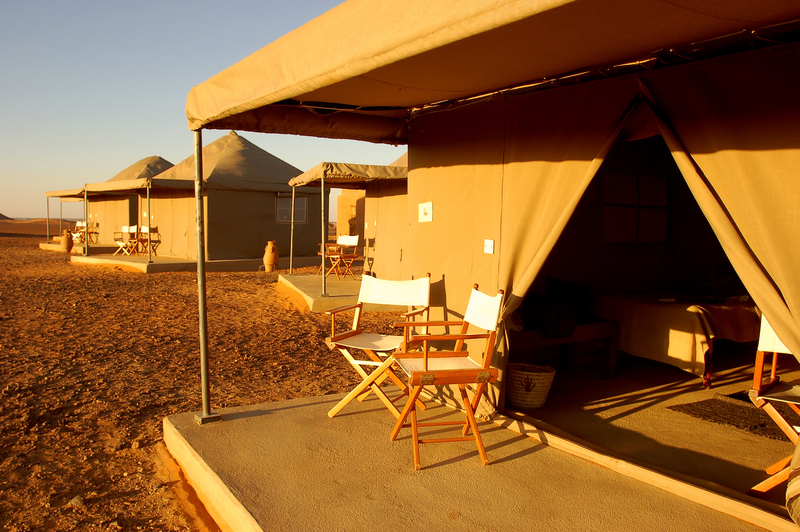 Accommodation in comfortable and fully furnished tents, dinner and overnight stay. Morning dedicated to the visit of the pyramids. 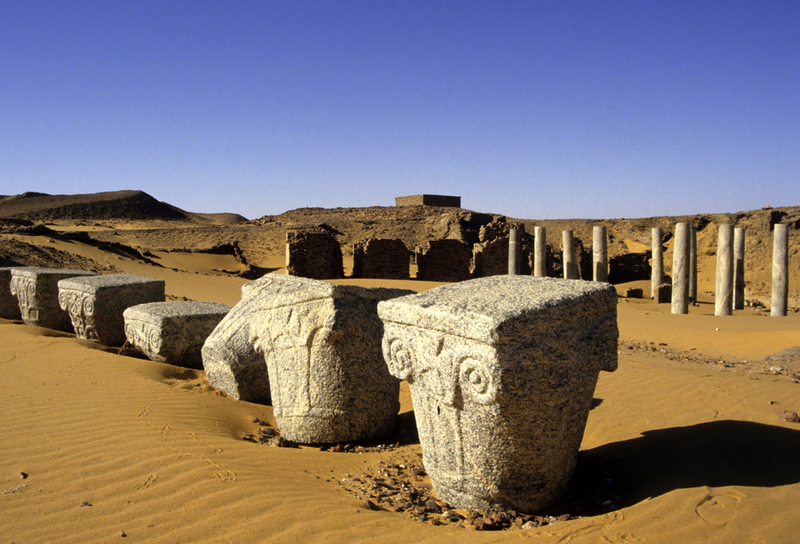 The Royal Necropolis of Meroe is located at about 3 km from the Nile on some hills covered by yellow sand dunes. 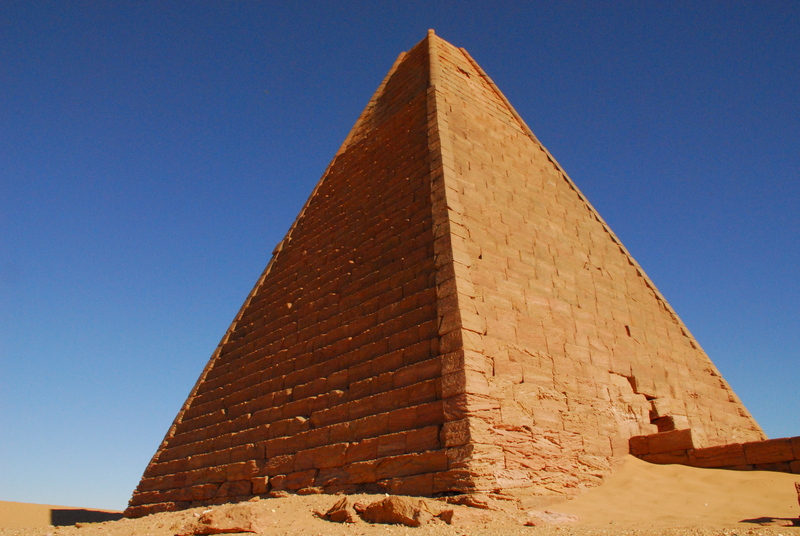 Several pyramids stand out with their sharp shapes against the clear sky. 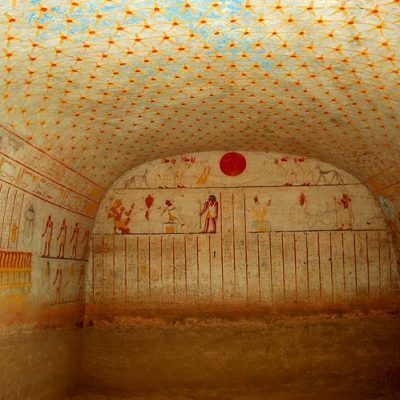 Each one has its own funerary chapel with the walls fully decorated with bas-reliefs that show the King’s life and offers to the gods. 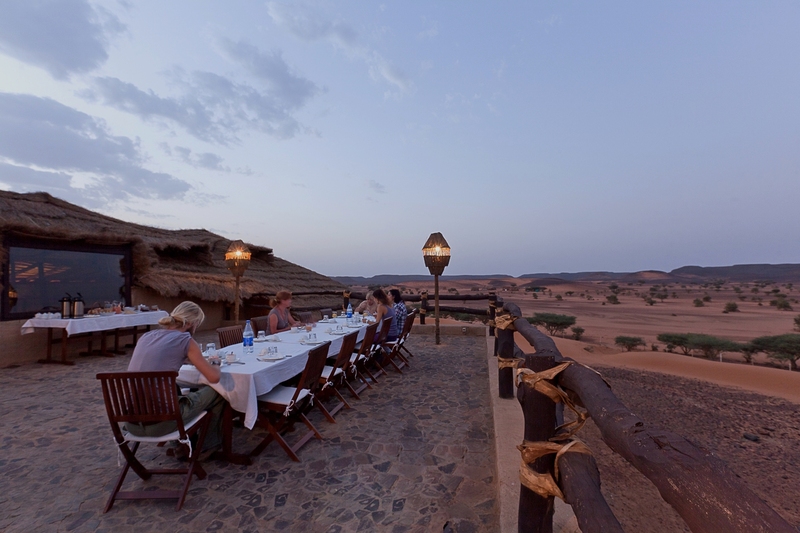 Lunch at Meroe Camp. 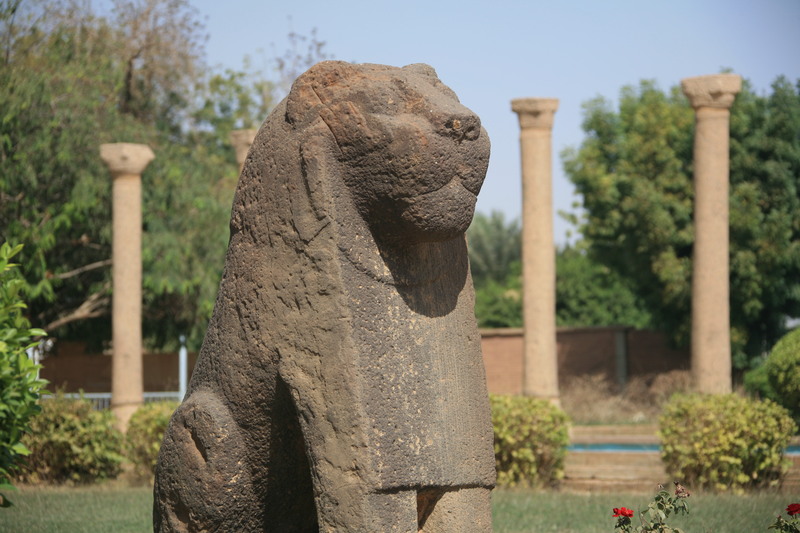 In the afternoon we move along the Nile to visit the ruins of the Royal city. The excavations confirm that the town of Meroe used to cover a large area and the Royal city was located in a central position, surrounded by suburbs and a boundary wall. 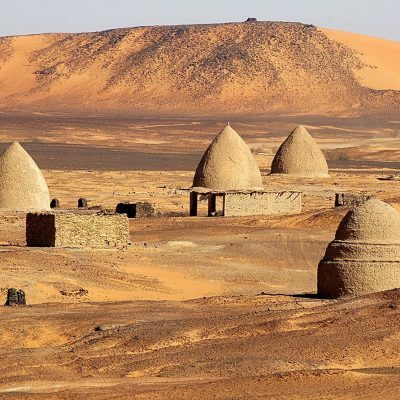 Most of the area where the city is located, formed by many small hills covered by red clay fragments, has still to be excavated by the archaeologists. 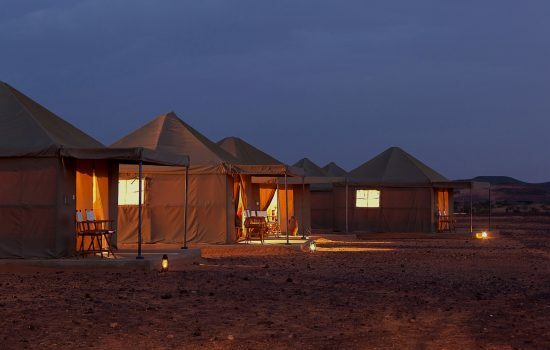 Dinner and overnight stay at the permanent Meroe Camp. 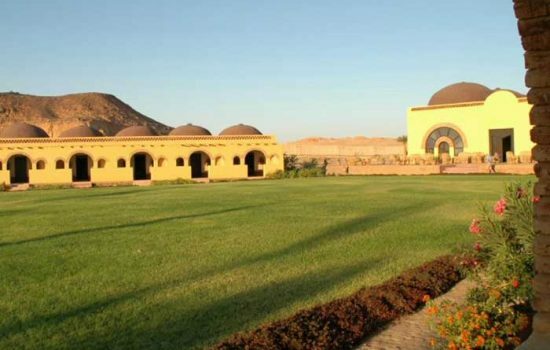 After breakfast we drive south and we reach Mussawarat which is located in a beautiful valley crowned by hills. Here the ruins of a very big temple are visible; it once played an exceptional important role. 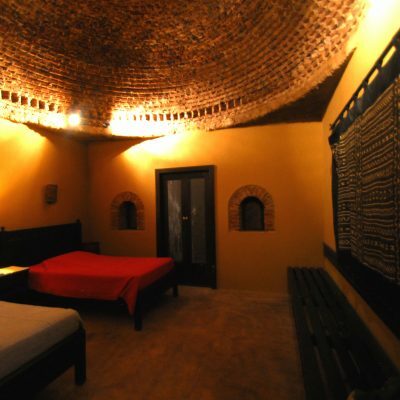 Its main characteristic, the “Great Enclosure” is made by many constructions and boundary walls which surround a temple built in the 1st century A.D. The large number of elephants represented on these walls makes you think that this animal used to have an important role in this area. Beyond the big wadi there is another temple – restored by a German archaeological mission – dedicated to the god Apedemak. 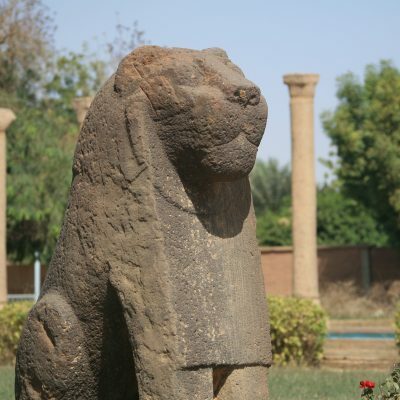 The site of Naga is located about 30 km to the east of the Nile and it is one of the two centres that developed during the Meroitic period. 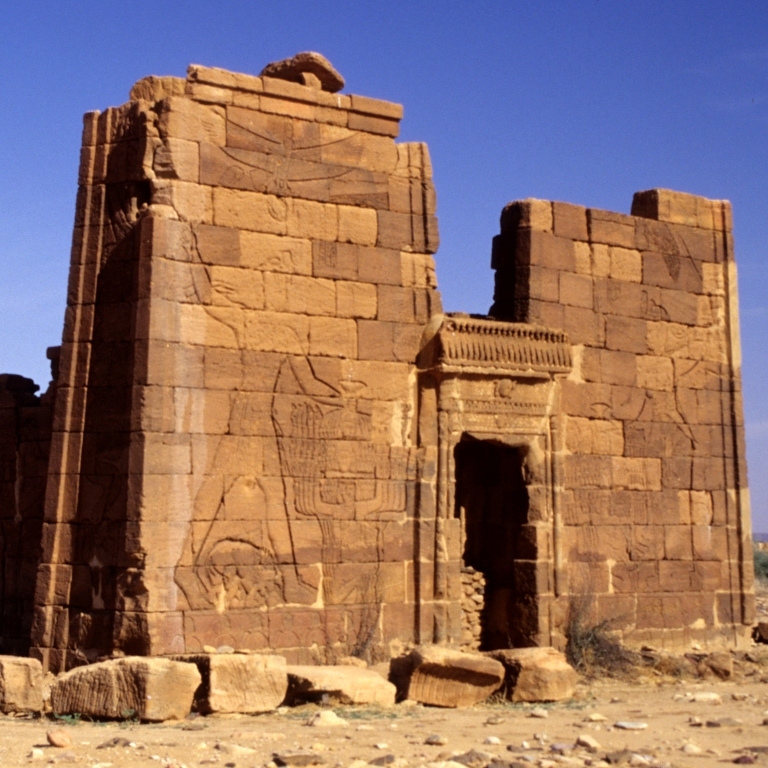 In Naga, in a typical Saharan environment with rocks and sand, we find a temple dedicated to Apedemak (1st century a.D.): a wonderful building with bas-relief decorations depicting the god with a lion’s head, the Pharaoh, noblemen and several ritual images. A few metres away there is a small and odd construction with arches and columns, named “kiosk”, in which we can notice Egyptian, Roman and Greek styles, all at the same time. Not far away we reach another temple dedicated to Amon with many statues of rams and beautiful gates decorated with bas-reliefs. 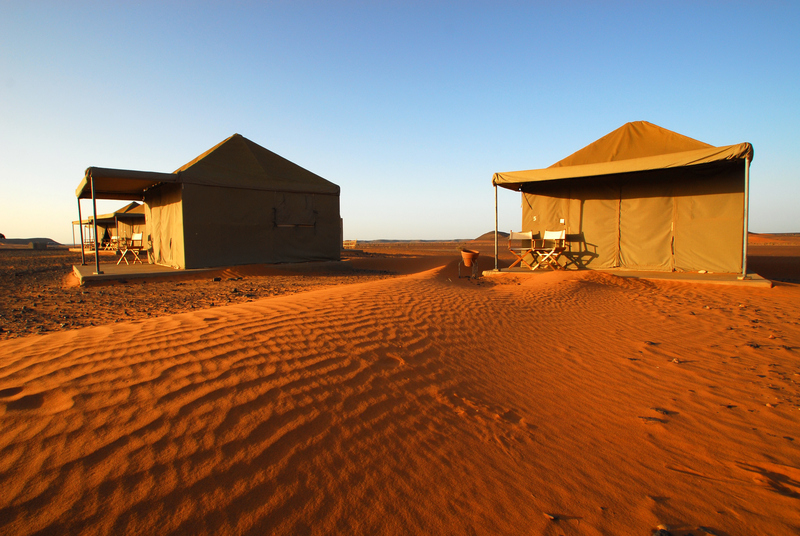 Picnic lunch in the area and in the evening we return to Meroe Camp. Dinner and overnight stay. After breakfast at the camp, we travel north to Atbara for about 80 km, then we follow the road to Port Sudan. Picnic lunch on the road. 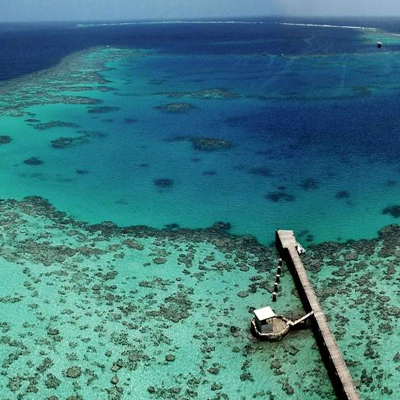 At 15.00 board your boat for a 8 nights reef experience – Sudan Classic North. Dinner and overnight stay on board. 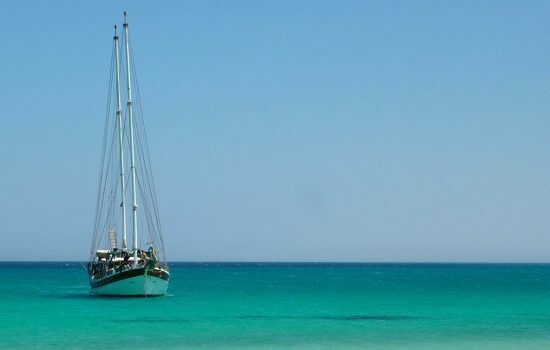 Departure to Sha’ab Rumi ( about 3,0 hours of navigation) where there are the follow diving spots: the legendary Cousteau’s precontinent and the wonderful south plateau (shark point). Meals and overnights on board. 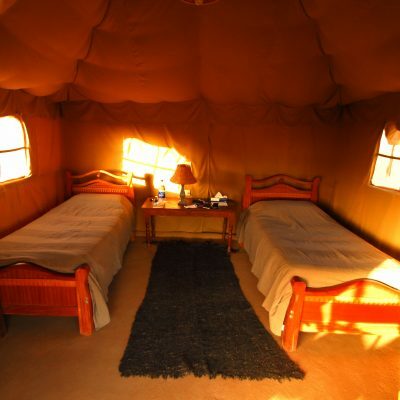 Stop en-route Shab Suadi and spend one night in Gurna Reef. Stop at Quita el Banna’s reef. 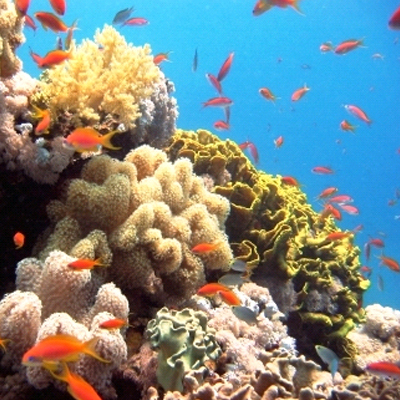 Departure to Abu Shagara reefs where you can dive in Merlo reef. Departure to Shambaya to spend the night diving in Merlo and Angarosh reef (shark point) then departure to Mesharifa island (Manta’s point). 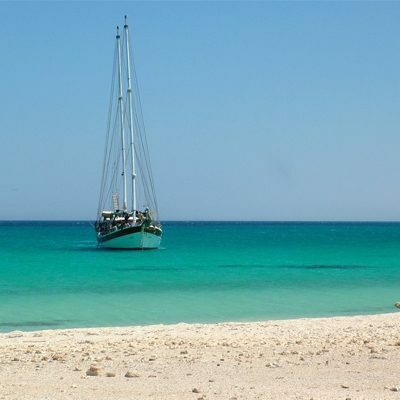 Today it will be possible to dive in Angarosh or Quita el banna and then we start sailing back to Port Sudan. 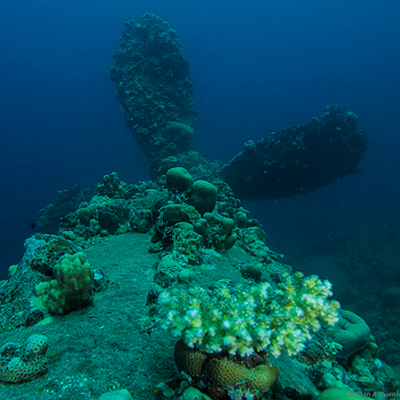 Dive in the south plateau and in Shab Rumi and at the Umbria wreck. 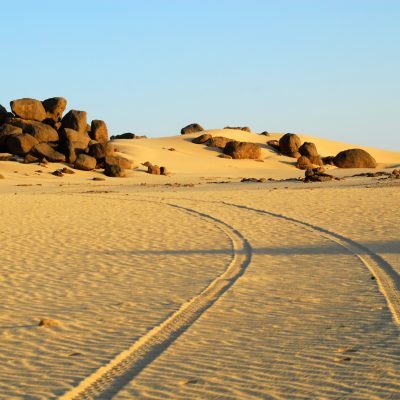 Reach Port Sudan and transfer to the airport to board your flight OR meet the car that will take you to Khartoum via Kassala. 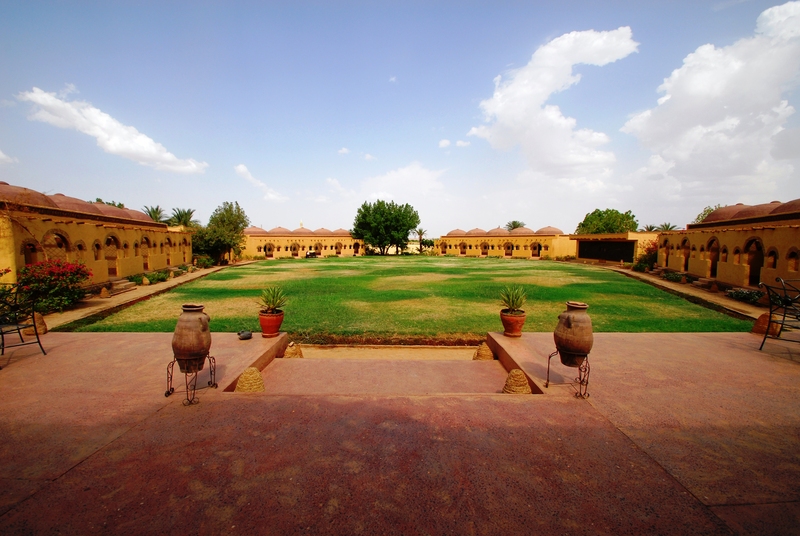 Hotel of your choice in Khartoum among Corinthia, Grand Holiday Villa and Acropole. M/Y Elegante during the cruise on the Red Sea. 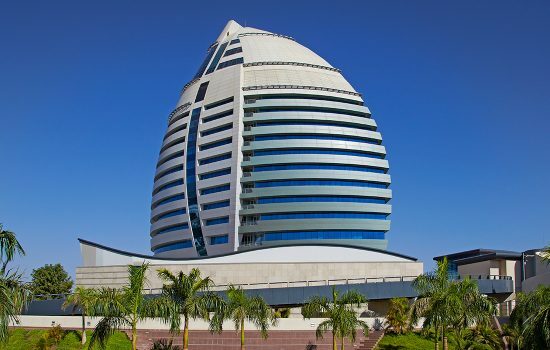 An elegant architectural masterpiece of steel and glass set in the heart of Khartoum’s commercial district, the Burj Al-Fateh Hotel redefines the luxury hotel category with state-of-the-art technology, five-star accommodation and unrivalled service. 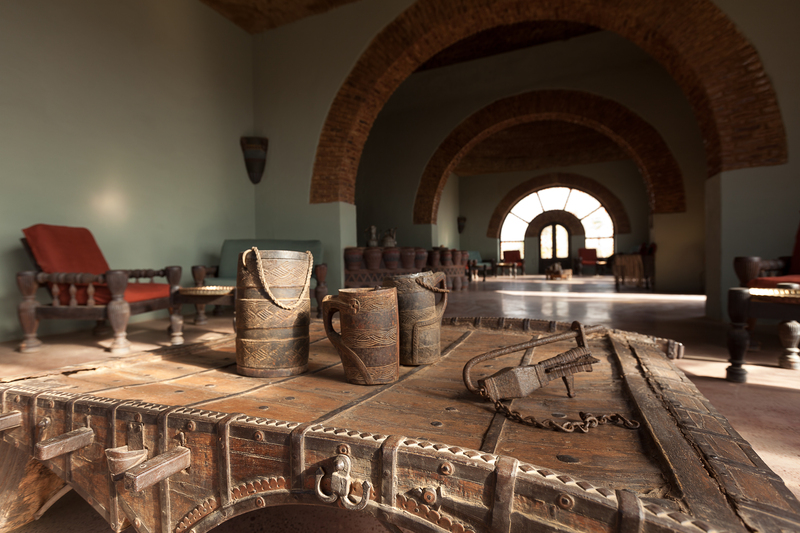 Situated at the meeting point of the Blue and White Nile and set among exquisite landscaped gardens, the Corinthia Khartoum will be your gateway to Central Africa. Formerly known as the Grand Hotel, it was constructed in the late 1800s and housed the office of the famous British Explorer: Thomas Cook. 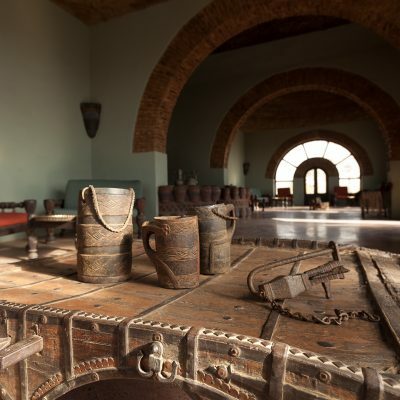 This elegant hotel which overlooks the famous Blue Nile River also hosted royal visitors and famous dignitaries including Queen Victoria and Sir Winston Churchill. 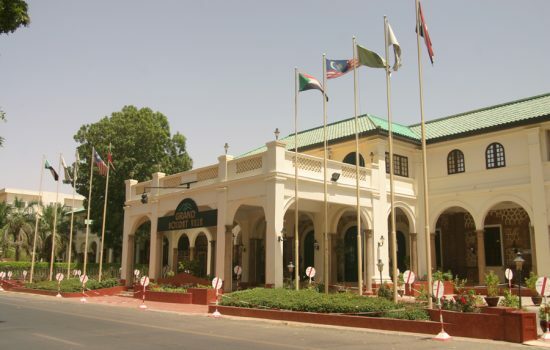 The hotel is centrally located in the heart of Khartoum’s commercial hub. 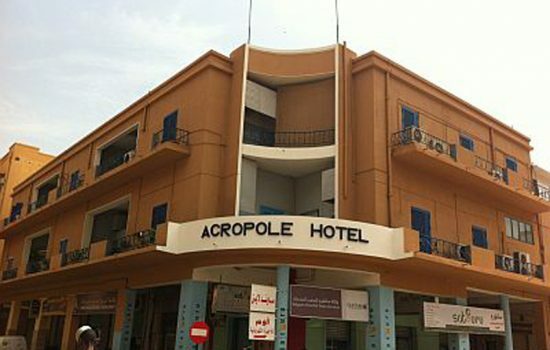 The Acropole Hotel is the oldest existing hotel in Khartoum, founded in 1952. 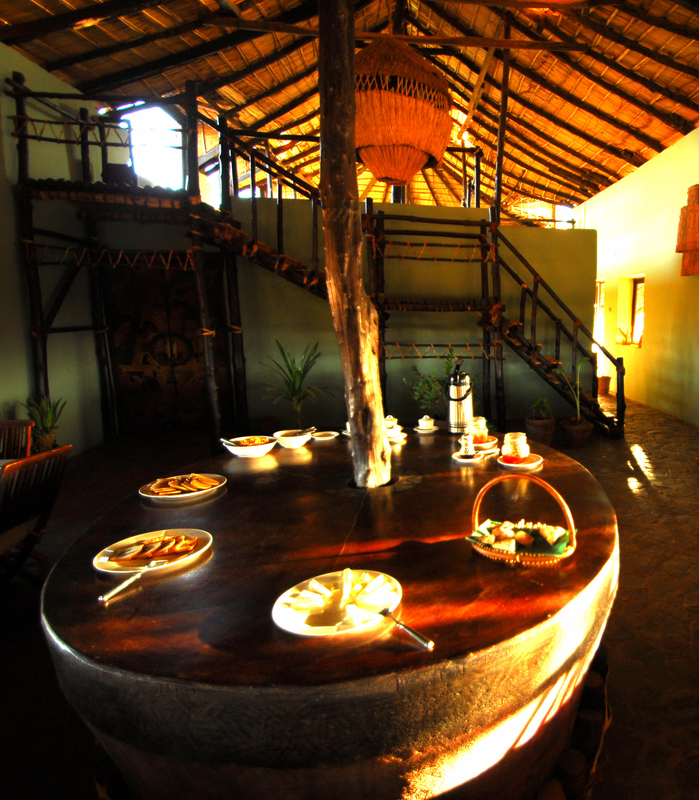 It is family run, cosy and characterized by a very friendly and warm hospitality. 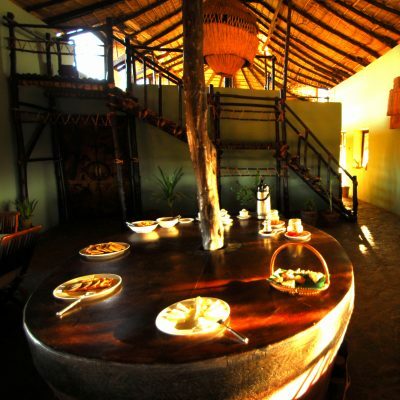 It is centrally located near shops, banks and important business firms. 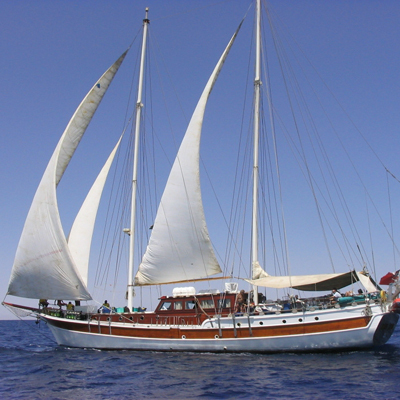 The Elegante boat is a beautiful schooner with Italian management completely renovated in summer 2009. 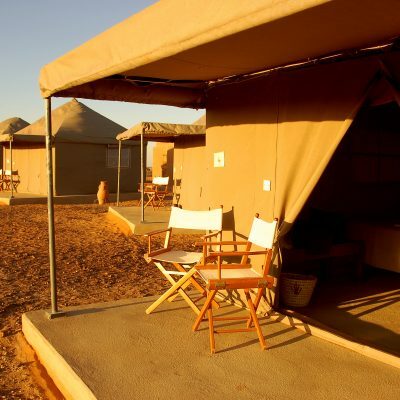 There are 7 double cabins with private tiolet and shower and air conditioning for guests.